The first day I rummaged through the recycling bins at HHS, I found a big bag full of old hall passes. Now, everytime I come to the high school, Mr. Lack hands me another big envelopeful. As the pile of passes grew, so did their influence on me, insisting that something be made with them. So, I brought in the sewing machine and have been sitting in the hallway outside Nest sewing hall passes together. They make nice blankets. We've been busy problem-solving in Studio 370 this past week. 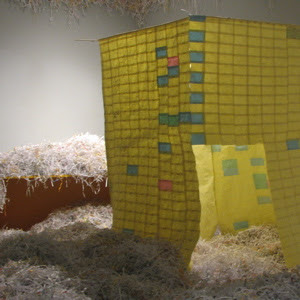 Initially, the big mound of paper in the middle of the room offered a huge invitation to jump and play. During that play, we discovered the incredibly dusty quality of the shredded paper. All day Wednesday and most of Friday were used "de-dusting" the vast pile of paper. Using window screening and a shop-vac, I filtered a great deal of dust out of the room, one armful of paper at a time. I felt like a character in a fairytale: not as bad as mucking out the Aegean Stables, but more like sorting a mountain of lentils and peas or spinning a roomful of hay into gold. 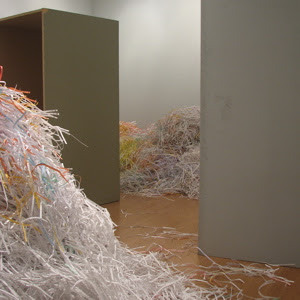 On Friday, the class came in and we rearranged the paper shreds to invite nestling in over jumping around. I wasn't sure if we would meet resistance from students who had come in earlier in the week and had a more boisterous experience. Many visitors reluctant to get up and leave on Friday afternoon affirmed that the quieter, more reflective space was well-received. 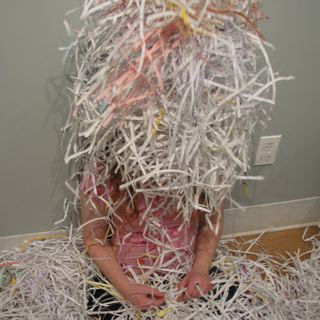 The pile of shredded paper is about seven feet high when mounded in the center of the room. While working on the boxes yesterday (behind the mound where I was often unobserved) I could overhear the comments of students walking by at the end of the day. "What is it?," "Sick" (is that good? ), "What's going on here?," "Wow," but most often the words, "I just want to jump in." Even with the door open, people are clustering in the doorway, not crossing the threshold. Even with Mr. Lack and myself saying, "Go ahead, jump in" there is a lot of hesitancy. One student observed, "But if I jump into it, it will never be the same again." When the students entered the room last Friday, the paper was piled in the center and the boxes were in different positions in the room. No one quite knew what to do. Hoping to loosen things up, I dove into the pile first, curling into a somersault as I would have done as a child. My last somersault was many years ago and this time I didn't roll so much as grind into the floor headfirst. In spite of my discomfort, people got the idea, and began to investigate. We talked about the bagful of hall passes rescued from the recycling bin. How they were used to grant permission to do basic things like get a drink of water or visit the bathroom. We wondered what kind of permission people would need to enter this space. Permission to play? to dream? to relax? to disappear? Whenever I've talked about working on an installation of materials generated by the school, I've been told "Paper, there's a lot of paper." Part of me hoped to find something more unusual than paper. Now that I've rummaged around the recycle bins, and learned how to use the Guidance Office shredder, I am finding this material has some unexpected and exciting qualities. Tomorrow morning, the students in Mr. Lack's Art I class will join me in the space as we begin to explore these qualities while creating Nests. During October and early November, Studio 370 at the Holliston High School will host NEST: a dream space. Artist Denise Driscoll will work with the students in Douglas Lack’s Art I class on a weekly basis, enlisting both their physical help and insight as creatures that need both space and time to dream.